A fruit and vegetable "fast" is my preferred cleansing method. It is not so extreme as the "Master Cleanse", yet in my opinion, it offers appreciable benefits similar to the Master Cleanse. "Anyone who has ever fasted will attest to this idea—that fasting is a process, which, through the negation of the physical, sharpens and hones our spiritual proclivities. It seems to open up something deep within the immaterial parts of our being." This is the idea that first attracted me to fasting in my early twenties. At the time I was reading Whitman's Leaves of Grass and truly wondering about, as Whitman writes, "the feeling of health, the full-noon trill, the song of me rising from bed and meeting the sun." So what it this "feeling of health"? The next three days just might offer you the opportunity to experience this feeling--perhaps for the first time in a long time, or ever--and this experience just might change you. Steve also notes another important aspect of fasting: "how much time we spend preparing food, eating food, or thinking about what to eat next." As Steve notes, "The entire day opens up when you are not concerned with these things." Now, you'll note that I suggest (below) preparing food each day, but undoubtedly you will find yourself with extra free time to...do what? I read. I write. I take long walks. So beyond the food suggestions below, I suggest choosing a great book to read over the next few days. Perhaps you might watch a movie (or two) each evening. Perhaps you can go to the Barnes Museum and look at still lifes of fruit. Try to do something that you truly enjoy. Cézanne, Compotier, Pitcher, and Fruit (Nature morte), 1892-1894, oil on canvas, Barnes Museum, Philadelphia, Pennsylvania. In general, I suggest buying an abundance of fresh, preferably local or organic, produce for the next three days. Try to stay seasonal: berries and cherries, greens and broccoli, fingerling potatoes or sweet potatoes--whatever you might find. If you like avocados, I suggest eating up to two or three avocados per day--sliced on salads, or mashed and served with pan-seared zucchini, boiled or baked potatoes, or sweet potatoes. Try to limit your fruit to 2-4 servings per day. Ideally, you will eat mostly vegetables. That said, for breakfast, I suggest consuming fruit: 1 cup blueberries, strawberries, cherries, or water melon. If you feel that this is not enough for you, add 1/4 raw nuts, like walnuts and almonds. After breakfast, I suggest drinking a high-quality, organic green tea--a tea that you will look forward to drinking. Before lunch, you might eat another serving of fruit. For lunch, I suggest consuming a large salad. Ideally, you will eat this salad with avocado (for the nourishing and sustaining fat). If you feel like you need more nourishment, add a baked sweet potato or potato. You might also try boiled fingerling potatoes. If you feel that this is not enough for you, add 1/4 raw nuts, like walnuts and almonds. For a salad dressing, try my Blackened Jalapeño and Avocado Dipping Sauce (below)--a recipe I developed for a prior fruit and vegetable fast. You can adapt this recipe to suit your tastes and or purposes. Leave out the jalapeños, if you prefer a mild version. Or thin with water and/or lime juice for more vinaigrette-like consistency. After lunch, if you feel hungry, eat a fruit snack. You might find a ripe banana sustaining. Remember to drink plenty of pure water, too, and high-quality green tea, if you like. For dinner, I suggest eating an abundance of steamed vegetables (like asparagus or broccoli) tossed with the avocado dipping sauce and a large baked sweet potato or potato. You might also enjoy boiled fingerlings tossed with avocado and sea salt. If at any time, you feel that you need more nourishment, eat a handful of nuts. Another suitable option is coconut milk. Blend coconut milk with fruit in the morning for a smoothie. Or you might simmer vegetables with coconut milk, lemongrass, and Thai basil for a nourishing dinner. Try my avocado dipping sauce for a delicious addition to salads, steamed vegetables, or baked or boiled potatoes. I originally published this recipe here. It's an adaptation of a wonderful recipe from my friend Obed. 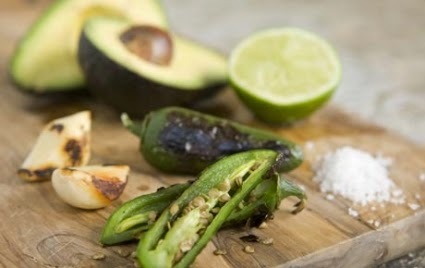 Transfer the jalapeños to a blender along with garlic. Add avocados, lime juice and salt and puree until somewhat smooth. With blender still running, slowly drizzle in about 1/2 cup water. Continue to puree until smooth and creamy. Transfer to a bowl and serve.